Pavilion echoes was a joint effort written by the twelve tourists. The previous two teams that toured “contained one or more scribes, blest with retentive memories, fluent pens, tipped with a fund of humour, wealth of epigram, and Twain-like elegance of diction (p.3).” This shows when reading the accounts as the prose in Pavilion echoes doesn’t make such pleasurable reading as the first two. The poems are hit or miss through the three books. These books were encouraged, no doubt by WF Buckland (manager & tour organiser) & WW Robinson (captain and star player) who were both keen poets. I wonder if the rest of the team shared their enthusiasm or merely accommodated it. 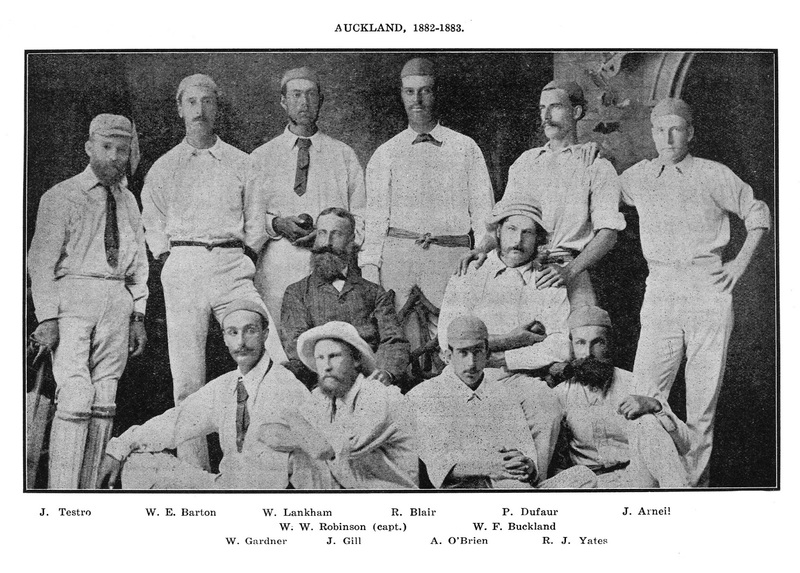 Ref: Auckland cricket team, 1882-83, from TW Reese, New Zealand Cricket. V.01. 1841-1914, p.226, Sir George Grey Special Collections, Auckland Libraries, 796.358 R32. As well as being entertaining accounts of the tours these publications provide a fascinating view of early colonial life in New Zealand. Travel for the tourists is largely done by steamer although from the ‘82 tour onward the team rode the train between Christchurch and Dunedin and back. Seasickness features prominently in the descriptions of the steamer trips down and then back up the country. In a section of pen portraits in Pavilion echoes (p.27) Dan Lynch is described as given to quoits, cigarettes, and seasickness. Although seasickness was such an issue, the ‘73 team didn’t hold this against the captain and “as a body signed a testimonial to his merits as a sailor and a gentleman, to be published in the Wellington Independent (p.20).” The team took the SS Wellington from Onehunga to Lyttelton. 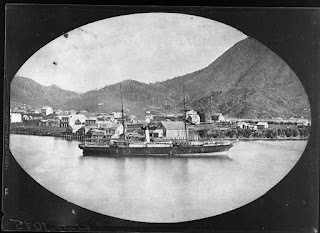 Ref: James D Richardson, View over Picton and its harbour with the SS Wellington in port, 1874?, Sir George Grey Special Collections, Auckland Libraries, 4-1075. 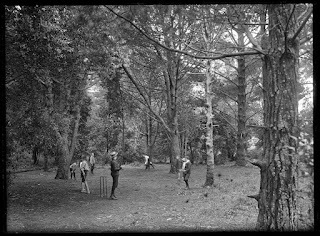 These tours must have fired the imagination of the public as they were greatly reported on in the newspapers and by the 1890s cricket was considered to be New Zealand’s national game. Ref: People in carriages watching a cricket game in the Auckland Domain, Sir George Grey Special Collections, Auckland Libraries, 5-2218. Although not everyone was a fan. During the ‘84 trip a fellow steamer passenger said that he couldn’t believe that people would travel from Australia to England and back to play such a game after watching the Aucklanders practice on deck. Notable by their absence in these accounts are Māori, especially compared to early rugby union teams. This applies too to women who largely feature as spectators at the games. The first Auckland Women’s cricket team didn’t appear until 1909. When the undefeated ’73 tourists returned a half-holiday was declared for Aucklanders to watch the champion team play a team of locals at Ellerslie. And a banquet was held in their honour the day after their arrival by the Reception Committee - made up of over twenty representatives of leading business firms in Auckland (p.48).” On the 19th December the New Zealand Herald reported on their return and described the Civic reception and banquet held in their honour in great detail. Interestingly the local cricket authorities opposed all these trips, and the Auckland Cricket Association and the local newspapers were vocal about the folly of the public subscribing to support the trips. Frank Buckland was the driving force behind organising the '73 tour, and he must have been a man of considerable energy as in addition to his career in politics he was the on the board of the Auckland Domain Committee when they drained it for a cricket field. Reese says that some of the drainage was most inexpensive; for it was done by convict labour. The ‘73 tour was a breakthrough for Auckland cricket and contributed to the formation of the Auckland Cricket Association. 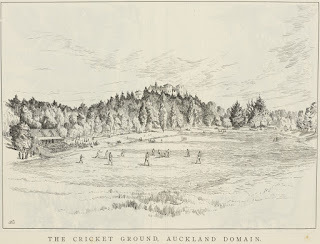 In the 1860s the Domain had been drained for a cricket pitch, but in the interceding years it became deserted and was taken away from cricket and cropped with potatoes and cabbages. 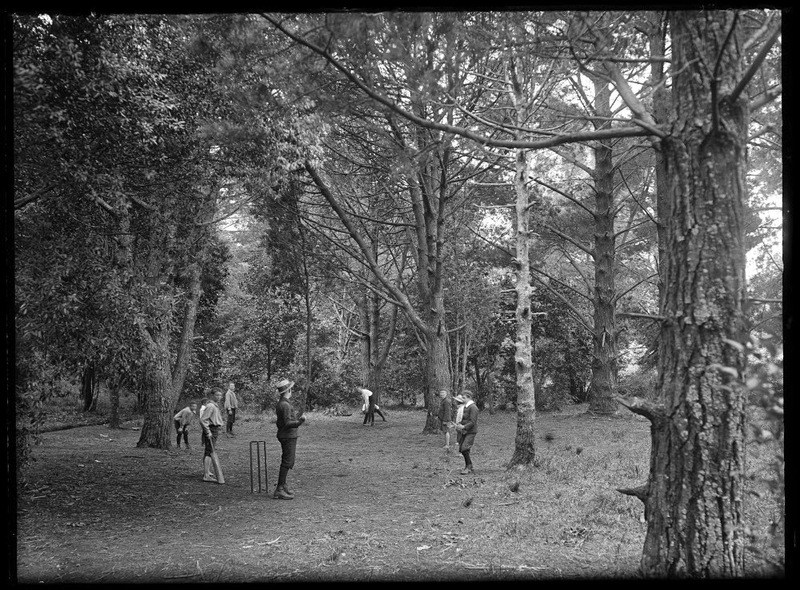 Ref: New Zealand Graphic, The Cricket Ground, Auckland Domain, 5 November 1892, Sir George Grey Special Collections, Auckland Libraries, NZG-18921105-1096-1. The ‘73 tourists were mightily impressed with Hagley Park: “without exaggeration the Christchurch cricket field will bear comparison with the finest grounds in England. It is certainly more level than the Oval at Kennington, while Lord’s Ground cannot be mentioned as approaching it (p.22/23).” The ‘82 team also held Hagley Park in high regard as they “lay down and rolled on the matchless turf” when they arrived in Christchurch, although they played at Lancaster Park. Another observation from the ‘73 trip was that “Te Ara Basin Reserve… will never be made a first class cricket field (p.39).” The Basin has hosted the most First-class games in the country, is protected by Act of Parliament and is New Zealand's only sports ground on the National Heritage list. All the publications include the scorecards from each game played. A few things stand out to the contemporary reader: the games usually lasted two days and were very much in favour of the bowlers. Byes were often amongst the top scorers even though a long stop was employed. 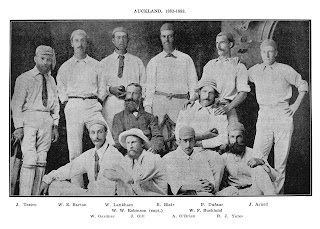 The only century hit on all three tours was by the Canterbury captain Fritz Wilding in 1884-5, also the first century scored against Auckland. The downfall of their darling boys, when led by – Fritz Wilding. I would strongly encourage any cricket fan to visit our reading room in the Central Library and have a look at these wonderful publications. 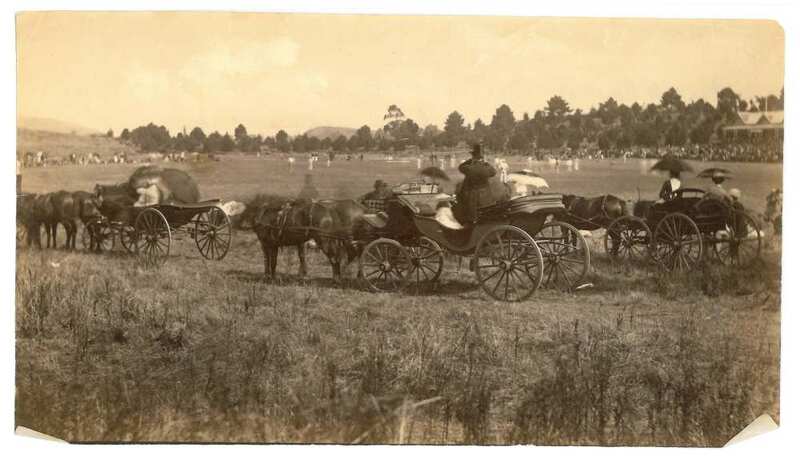 Failing that our friends at the National Library of Australia have digitised On the tented fields of the south, so you can read that online. For more about the beginnings of cricket in Auckland see Jim Allnatt’s Auckland cricket 1841-1901 : the Victorian era.